» The same, only different! The blow up about HarperCollins and the 26-use limit for library ebooks raises a lot of interesting and contradictory issues in the library/publisher relationship typology. One of these is how, at various turns, one or the other of the parties wants ebooks to behave just like print books. Then, after a moment of arguing, the parties change sides. This begins to be a little ridiculous after a while. In an NPR story Monday (yes, the issue has risen to NPR level visibility), Eli Neiburger raises some of these points. A trendspotting symposium hosted by the Connecticut Library Consortium today also highlights the topic. There are a lot of good tweets, if you weren’t able to attend. Clearly, the notion that ebooks and print books should behave the same is absurd. But both parties have a hard time giving up the idea. From a commercial perspective it is easy to see why. Print books are unique and discrete objects. Despite the bibliographic complexities of bookishness (see FRBR ideas of “work,” “expression,” “manifestation,” and “item”–PDF), a single book can be sold, owned, shelved, loaned. But it is never more than a single book. It gives comfort to the seller and the buyer. The sense of ownership is clear and the limits on duplication and distribution are obvious. All of that goes out the window with ebooks. What does an owner own? How can the imminent (and infinite) power to duplicate and disseminate be limited? But we cling to the notion that print books are comforting. 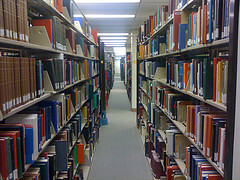 We love the idea of browsing the stacks for books, although we can’t find the one we originally went in there to get. We like to “curl up” with print books. Even though ebooks in no way inhibit curling, and might, in fact, aid it. We wish ebooks could be more like print books, only different. And when one pays the same amount as for a hardcover, shouldn’t one own the item? It shouldn’t be erased from the reader by the vendor, or should it? Who owns it? On the other hand, you wouldn’t argue about something I’d written and put on a thumb drive. Even if I’d put it on my ereader. Once one pays for software, it’s purchased, only when missused is it frozen, or etc. The comforting thing about print books is that they take more abuse, can be dropped, have tiny amounts of liquid dripped on, slightly soiled, and will continue working. They can be resold, lent, and inherited. How long will the ebook files integrity last? Cathy: good points. Everybody is perplexed about what to do with ebooks. It is definitely a culture we need to work out.